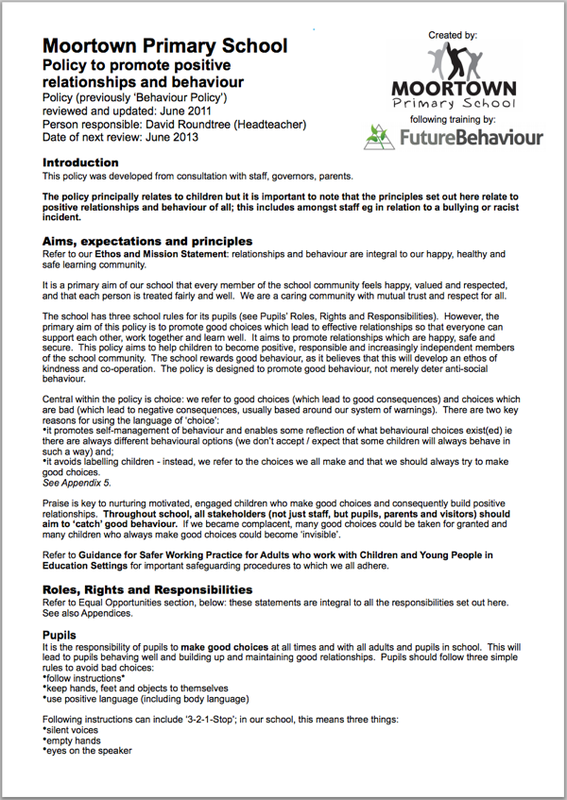 Why do so many behaviour policies sound the same? Below you’ll find a link to a behaviour management policy. I think it’s brilliant, and I’ve read a few in my time. Lots of them sound very similar. There is invariably stuff about praise and high expectations and how bullying isn’t tolerated. Often though, specifics are thin on the ground. What makes this policy so effective? I think it’s the fact that it is simply based on the school’s amazing practice. They put the practice first and then let the policy come from that. You can’t really do it the other way round. Here it is. If you’d like a Word or Pages version, just drop me an email. A big thank you goes to David at Moortown Primary for sharing it with us and with you. Also, if you’d like help with your personal or whole-school behaviour practice then get in touch.